This volume studies the architecture and urbanism of modern-era Italian colonialism (1869-1943) as it sought to build colonies in North and East Africa and the eastern Mediterranean. Mia Fuller follows, not only the design of the physical architecture, but also the development of colonial design theory, based on the assumptions made about the colonized, and also the application of modernist theory to both Italian architecture and that of its colonies. 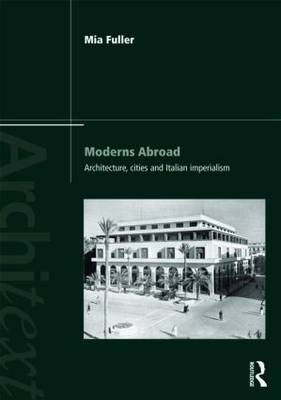 Moderns Abroad is the first book to present an overview of Italian colonial architecture and city planning. In chronicling Italian architects' attempts to define a distinctly Italian colonial architecture that would set Italy apart from Britain and France, it provides a uniquely comparative study of Italian colonialism and architecture that will be of interest to specialists in modern architecture, colonial studies, and Italian studies alike.